Use on batteries with automotive-style terminals to which you’ve added clamp-on marine terminals. 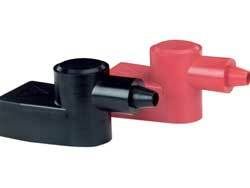 Molded PVC enables installation of the CableCap after the terminals are crimped on cables. One pair, in red and black. For 4,2 and 1 gauge wire. Kategorie: Komponenty elektryczne. Autor: Robert Piskorz. Dodaj zakładkę do bezpośredniego odnośnika.